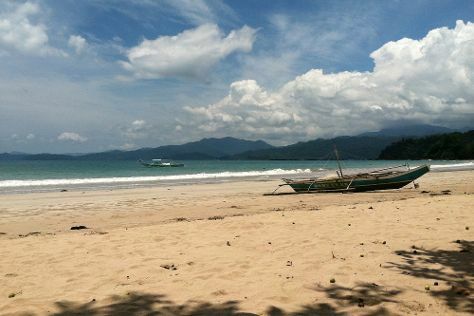 We've included these beaches for you: Sabang Beach and Nagtabon Beach. Popular historic sites such as Plaza Cuartel and City Baywalk are in your itinerary. The adventure continues: Head underground at Puerto Princesa Underground River, explore the gorgeous colors at Tubbataha Reef, step off the mainland to explore Lu-Li Island, and contemplate the waterfront views at Honda Bay. To find reviews, other places to visit, more things to do, and other tourist information, use the Puerto Princesa tour planner. Ubud, Indonesia to Puerto Princesa is an approximately 8.5-hour combination of taxi and flight. May in Puerto Princesa sees daily highs of 38°C and lows of 30°C at night. Wrap up your sightseeing by early afternoon on the 10th (Wed) to allow enough time to travel to Coron. Start off your visit on the 11th (Thu): kick back and relax at Banol Beach, then head off the coast to Banana Island, and then head off the coast to Coron Bay. Get ready for a full day of sightseeing on the 12th (Fri): explore the gorgeous colors at Skeleton Reef, then step off the mainland to explore Bulog Island, and then explore the activities along Kayangan Lake. To see other places to visit, traveler tips, ratings, and other tourist information, go to the Coron holiday planner. Getting from Puerto Princesa to Coron by flight takes about 4 hours. Other options: ride a ferry. Finish your sightseeing early on the 12th (Fri) to allow enough time to travel back home.